In this intimate narrative of his travels through Italy, appearing in English for the first time (it was originally published in 1954), Giono brings his novelist’s sensibility not only to the beauty and surprise that is Italy but to the profound questions of why one travels, and what one brings to such an undertaking. French but of Italian origin, Giono is one of this century’s most important novelists. His journey follows the well-trod route from Turin and Milan through Venice, the Apennines, and Bologna. But it is not so much the cathedrals and palazzi, the museums and panoramas that interest Giono as the national character that can be read in the —humanity of a minor road— or the magical encounter between Catullus and Dante and ’scantily clad typists from Milan . . . pedaling water-tandems together with their bosses— on the banks of Lake Garda. Giono hates the behavior of tourists, is bored by the azure of Naples and Capri, and hates politics—but he is charmed by priests on Vespas and loves espresso. We get a little bit of everything in the mix, as well as Giono’s contemplation of happiness, retreat, melancholy, and friendship. Immersed in so much history, Giono reflects that there are only a few historic dates in each year, and —the rest of the time . . . life is without history, when it’s a matter of how to be happy.— Late in his tale, Giono considers that Machiavelli had a lot to say about the nature of power, but it may have been —having his shoe repaired by a perceptive cobbler, or a chat with a very sensible grocer on his doorstep, [that] put him on the right path . . . — An Italian Journey shares that, too. 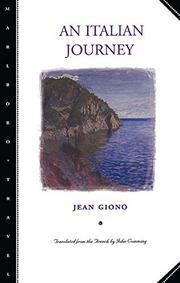 Giono skips over the obvious, goes right for the magic of his subject, and adds his own richly invested insight. His enchanting invitation to the idiosyncratic charms of Italy stands out brightly among the ho-hum abundance on the subject.